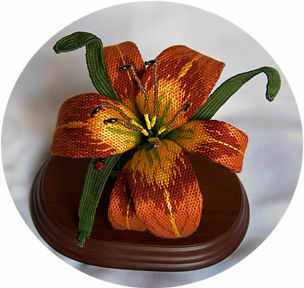 This delicate lily was created for my expertise piece for NAN teacher certification. It is stitched on white congress cloth using Au ver a soie silk threads. God picked the colors, I matched them to his lily. Wire is stitched to the back of each piece of congress cloth so that the petals can be shaped after finishing. The leaves are created by wrapping wire with stranded cotton floss. If you look on one of the leaves you will see a tiny little ladybug – she is stitched on 40 count silk gauze and then appliquéd to the leaf. Beads are added to create her feet and head. The back of each petal is finished with ultradsuede fabric. The lily is made of seven separate pieces which are wrapped with floral tape and secured with wire to a wooden base.